by Shalom D. Staub (ed); Mark S. Singel (fr); M. Mark Stolarik (pf). 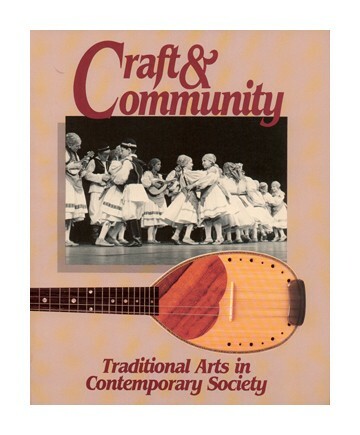 Essays: Traditional Craftsmanship in PA: An Ethnographic Perspective; The Wood Family: Generations of Stone Carvers in Delaware County; Robert Moore: Native American Craftsman; Terrence Cameron & Aguedo Beltran: Musical Instrument Makers; Frank Valentich: Croatian Tamburitza Maker; The Allison Park Quiltmakers; Bob Rock: Blacksmith; Hickory Furniture Makers in Southwestern PA; The Ethics of Craftsmanship Among the Lancaster County Amish; Psyanky: Craftsmanship, Ritual Meaning & Ethnic Identity; They Know the Rule for What Will Make It Pretty: Hmong Material Traditions in Translation; The Selling of PA German Folk Art; & Redware Revival & Re-Presentation: A PA Pottery Tradition. Color & b&w photos.